“Urban Phylogenesis” a project by Lingyi Gu and Isaac Hametz, developed in the ParadoXity studio New Orleans 2011. With a history of innovative waste management, and available real estate, New Orleans is ideally suited to host an experimental wastewater treatment intervention. Beginning at existing nodes of acceptance, Urban Phylogenesis strategically deploys compost toilets and associated sanitary gardens. Discharge is treated at these sites biologically and without water, and then used to enhance the garden’s soil fertility. Firsthand, positive experience at these nodes leads to greater knowledge and acceptance about biologically treated discharge within the community and leads to increased interest in additional sanitary gardens. 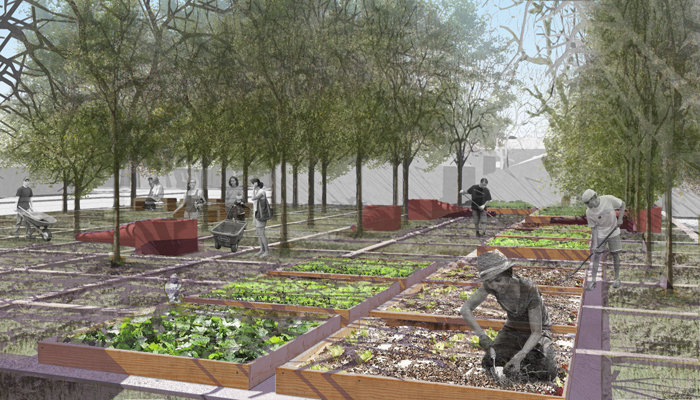 Educational programming, as well as public and private partnerships, supplies community demand with skills and financing to create additional sanitary gardens that populate the city’s abandoned lots. As the number of these sanitary gardens increases, the failing wastewater infrastructure is abandoned. The decentralized, waterless, discharge system becomes the city’s primary means of treatment. In addition, the sanitary gardens enhance neighborhood vitality by integrating personal and public activity in a safe and shared space.